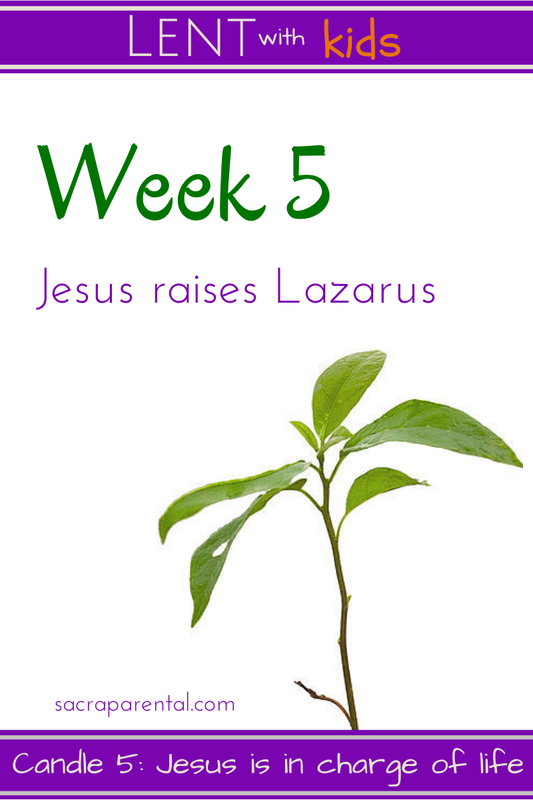 This is an all-in-one post for Week 5 of our Lent with Kids plan. To fill in some background, start here. You can also see the series index here. that even death cannot hold back. forming for yourself a people with whom to celebrate life. you have sent to us one who is both life and resurrection. and called us forth into the fullness of life and peace. The story of Jesus bringing Lazarus to life after four days in the grave is important (it’s the climax and centre of John’s Gospel, pointing the way to Easter), moving (Jesus cries, and he’s not the only one) and busy (a long and complex story with lots of characters and references to things before and after). It’s a brilliant text to get your teeth into and a good one to use to help kids develop skills in reading the Bible. The main thing in this post is a detailed plan of how to do a ‘lectio divina’ reading of this story. But first, here’s this week’s Quick Guide with a bunch of different resources to help your household. As always, I’d love your input in the comments with extra links, tips and resources to share around, and stories of what’s going on in your house. This is the longest single story in John until the events of Easter, and the climax of John’s revelation of who Jesus is. If you’d like to know any more about it, browse through the resources at TextWeek.com, or head straight to Pulpit Fiction (yep, really) for a podcast and accompanying written notes on this passage. The brackets are optional depending on your family stage and your approach to talking about death. 1. Confession of Faith. Who do you say Jesus is? Artworks to look at together: There are lots of characters and scenes in this week’s reading. Some detailed paintings to look at include these ones. Chat together about who each of the people is and what they are thinking and feeling in the painting. JESUS MAFA. 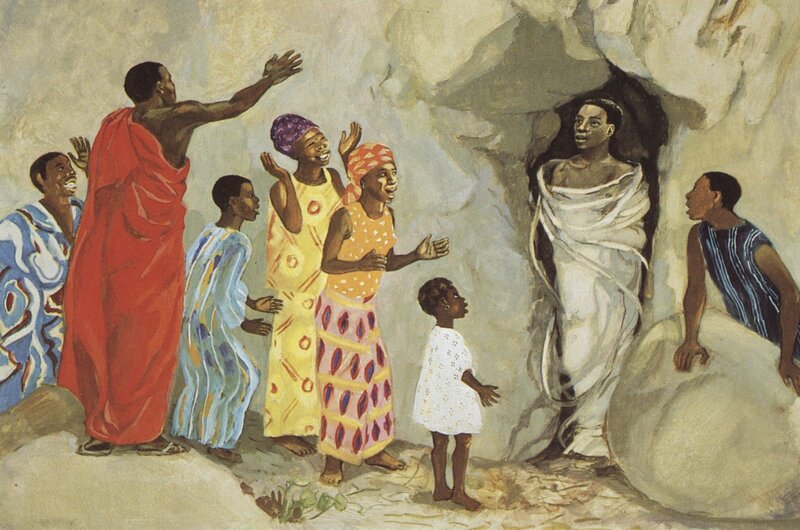 Jesus raises Lazarus to life, from Art in the Christian Tradition, a project of the Vanderbilt Divinity Library, Nashville, TN. This is a painting of how a community in Cameroon acted out the story. 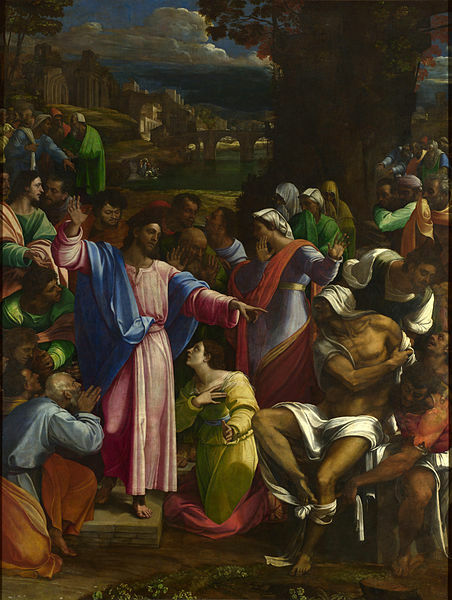 The Raising of Lazarus (c 1517-1519) Sebastiano del Piombo, via Wikimedia Commons. Poems: David Constantine wrote a pair of sonnets, Lazarus to Christ and Christ to Lazarus. They made me cry! The poems are below. Art and craft: Make and decorate necklace-labels (a big piece of card, with string attached to hang around the neck) for each of the people in the story: ‘Jesus’ ‘Martha’ ‘Thomas the Twin’. Use them to act out the story. 1. In his letter to the Roman church, Paul told Christians to ‘mourn with those who mourn.’ It is an act of deep, radical hospitality to cry with someone who is crying, or let them cry in your comforting presence. Is there someone in your circle who needs a shoulder to cry on? Invite them for dinner and let them know you are available to listen if they need to talk about something hard. Before you do so, sharpen up your listening skills with this guide. 2. If that’s a bit hard-core for you at the moment, here’s a list of useful ways to show support and hospitality to people who are struggling. Pick something to do this week – and ask any kids you are doing Lent with which one they could do. Movies: There are lots of movies for adults with themes of resurrection. Any ideas for kids? Pop your suggestions in the comments below, please! Simon Says: one person is in charge of everyone’s movements in this game. Chat afterwards about how much this is like Jesus being in charge of our lives and how it is different. Reading for adults: Gordon Atkinson (aka Real Live Preacher) wrote this raw account of spiritual burnout. It’s a key source, for me, of the idea I expand on below, that what Jesus calls us to is not ‘faith’ but ‘faithfulness’. Read more here. Browse the list at TextWeek if you’d like some background on the Bible reading. The ‘lectio divina’ is a Benedictine Bible reading prayer discipline that is traditionally done together in a group. Kids and teenagers often find it appealing and helpful, so I reckon this could be a great family activity to try this week. If you’d like more background on how adults have traditionally practised it, start with Wikipedia! We’re going to launch straight into an adaptation aimed at doing this in a home or church setting. It’s more active and less contemplative than the traditional version. Feel free to do something in between these extremes – whatever suits you. You could do this over a whole week, with one or two steps each day, or you could do it all in one long session with older kids. I will be leading our church through the whole process on Sunday morning, so I do think it will work to do it all in one go. Ask God’s Holy Spirit to speak to you through the Bible text. – have a pencil or crayon in your hand as you listen to someone read, and draw or doodle or underline as you listen. – close your eyes to concentrate and picture the scene. Read through the text together again, and practise being a journalist. Talk together, and make lists about the who, where and when. What’s the timeline? Listen for all the times John mentions how long something takes or when it happens. Now that you know the characters, the settings and the scenes, act it out together. Make name-tags or signs to hang around people’s necks to show who is playing whom. As simply or elaborately as you want, now act the story out. A simple version is for someone to read the text while the characters move around to illustrate what’s happening. A more elaborate version is to use the text as a script, and have each character speak their own lines. You could even do this step on another night if you want to have time to organise costumes and props or learn lines. Now that you’ve done some thorough observing, it’s time to try and make sense of what you’ve noticed. Why did each person do what they did? What effects did each person’s actions have on what happened next? What was John trying to show us in telling the story this way? What did John want us to know about Jesus? Ask the Holy Spirit to keep drawing your attention to things in this story as the week goes on. As I said, we’re doing exactly this tomorrow at church. I’ll be keen to hear how it goes for any of you! Please do leave a comment below. Four days down when you hauled me back into the air. I believe you lie awake to overhear. You too are curious, you too make me afraid. I cannot get the foist out of my flesh. And you were troubled in your mottled shroud. It will be done to me too, on the third day. I hauled you out because I wanted to. I never wept for anyone but you. There are plenty of ways to join the conversation and keep in the loop. You can get emails whenever there’s a new post here by signing up at the top of the right-hand sidebar, and/or also follow me on Facebook (for extra links and resources, daily), Pinterest (for link-plantations!) and Twitter (for ranting and raving). thanks for these ideas, I am a big fan of Lectio Divinia and used to teach it to young adults but for some reason I had never thought of using it with kids ! We did it today at church, including a bunch of 11-15 year olds, who got right into it. We turned it into a Boggle-style review of who noted which people/places etc and I was super impressed at hwo much they were all taking in.